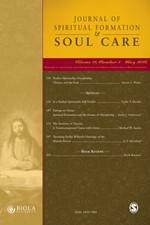 The Journal of Spiritual Formation and Soul Care has been going for ten years, and has recently become available as an academic journal through Sage Publications. If you’re not familiar with the journal, you should check it out, and if you’re in pastoral or spiritual formation practice, consider subscribing. It’s got a proven track record and easy distribution now. The ten-year anniversary issue is full of good stuff, including some programmatic and retrospective pieces, and a set of essays by members of the board of editorial consultants, reviewing books that are, in their opinion, especially important for the spiritual formation movement. As I was rearranging some shelves recently, I was struck by the fact that my books on spiritual formation occupy a peculiar region. They live somewhere toward the end of the whole theological collection, after the books on Christology and pneumatology and ecclesiology; in fact they’re about as far from the books about God and Christ as you can get. They’re somewhere between ethics and eschatology. In the Library of Congress classification system, they’re around BX4511. That’s what we used to call practical theology, and it’s a region of books more or less dominated by studies of technique. I know there’s nothing metaphysically prescriptive about book organizing. Books that are intimately near to each other in spirit can be physically far from each other on the shelf. But the reason my attention was drawn to the strange loneliness of my spiritual formation books at the end of the shelf is that their distant placement did in fact strike me as the outward sign of an inward reality. Here is the problem: Spiritual formation is, or ought to be, all about the change that comes about in people when they encounter the true and living God in deep and transformative ways. The subject of God should loom very large in the field of formation. As A. W. Tozer famously wrote in The Knowledge of the Holy, “What comes into our minds when we think about God is the most important thing about us.” To say the same thing in more Trinitarian idiom, the person and work of the Son, and of the Holy Spirit, are theological subjects without which spiritual formation is impossible. What are we to read if we want to think great thoughts of God and to be intentional about spiritual formation simultaneously? There are a number of writers who manage to do theological reflection with enough scope to take in both poles at once. Some books succeed at this task so well that they actually resist being shelved at either end of the spectrum. In my estimation, one such volume from the past decade is Donald Fairbairn’s 2009 book Life in the Trinity: An Introduction to Theology with the Help of the Church Fathers. Fairbairn is professor of early Christianity at Gordon-Conwell Theological Seminary—that is, his expertise is in patristics, not in systematic theology or spirituality. In many ways, this book represents a popularization and extension of his specifically patristic scholarship, Grace and Christology in the Early Church (Donald Fairbairn, Oxford 2003). There Fairbairn argued that the reason there is no separate treatment of soteriology in patristic writings is that the patristic treatment of Christology was already so soteriologically determined that the major decisions about salvation were already bundled into the discussion about the person of Christ. In Life in the Trinity he generalizes and extends that argument, with constant reference to the church fathers. By calling on the help of the church fathers, Fairbairn reaches back to a classical approach that predates the split between doctrine and devotion, between contemplation of God and transformation of the self, between theology and spirituality. By being well grounded in his own field, Fairbairn is able to reconcile the other two fields. The patristic angle also functions properly here to make the book more biblical. His method is not merely to pile up quotations from the fathers. One of the things Fairbairn has learned from the fathers is to pay close attention to the words of Scripture, so the book mainly develops as a reading of select Bible passages according to the way the Fathers read them. While what Fairbairn presents here is not detailed scholarly exegesis of the biblical passages in question, it is certainly biblical exposition. In that sense, Life in the Trinity bridges not only the systematics-spirituality gap, but also the gap between those disciplines and the field of biblical studies. Of course he can only accomplish this great unifying performance by carefully staying at the introductory level. By framing Life in the Trinity as a supplemental textbook to be used in basic doctrine classes, Fairbairn effectively recommends that all students of doctrine ought to start out by learning what he has learned from the church fathers. I second that recommendation: everybody setting out to study theology or spirituality (or for that matter, biblical studies) ought to learn what Fairbairn has learned from patristics. What he has learned is that the heart of Christianity is the Son’s relationship to the Father. In Fairbairn’s view, the central idea of Christian faith is “believers’ sharing in the warm fellowship that has existed from all eternity between the persons of the Trinity, a fellowship that Scripture announces to us when it speaks of the Father’s love for his Son” (p. 11). Check out the whole review essay, and check out the Journal of Spiritual Formation and Soul Care.